Did any one of you try #Veganuary? Well I did. Okay, not for the whole month, but for a week. Diets are taking the world by storm and every day there’s a new way to feed your body — intermittent fasting, vegetarianism, keto diets, pescetarianism, and of course, veganism. People diet for various reasons, and many diets do become lifestyles. Reduced to zero animal content diets have become more popular for ethical and environmental reasons. Veganism: The practice of refraining from consuming (or using, for some vegans) animal products, not only meat but also eggs, dairy products, and other animal-derived substances. When Kachi suggested a Veganuary feature, I was eager to give it a go, because I eat (and enjoy) more veggies than most people I know. I also can’t remember the last time I bought or cooked beef or pork. My reasons are not for a strict diet adherence, but rather because I simply prefer fish, legumes (beans, chickpeas, lentils), and even chicken (which I occasionally eat) over meat. My mother will confirm that I’ve always been this way; as I child, I frequently begged my brother to eat my meat. The hardest thing I struggled with was adjusting to a breakfast without animal protein. I’m big on eggs and the occasional canned tuna. I substituted my usual breakfast of bread and eggs with bread and peanut butter or oatmeal. Actually, I ate a lot of oatmeal. Initially, I only jazzed it up with my usual cinnamon, peanut butter, and chia seeds. As the week crawled on, however, I added more fruits to bulk up my breakfast. 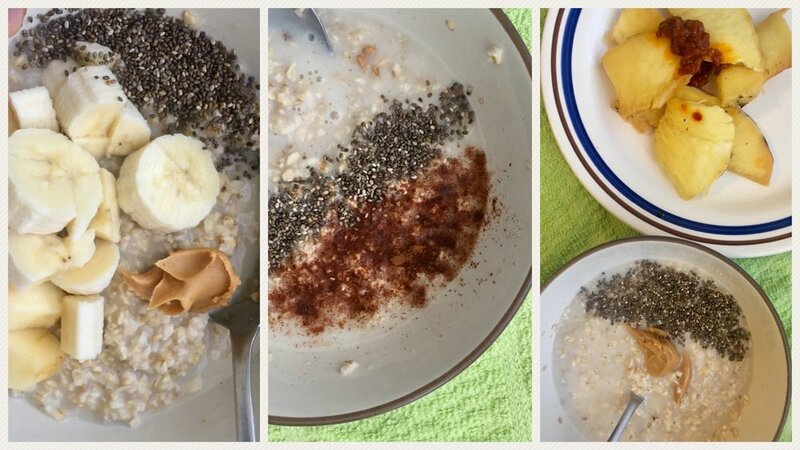 Third photo is oatmeal with a side of leftover roasted breadfruit. My lunches didn’t change much. I ate pasta, but just made the stew without meat. In medical school, I used to add lentils to my stew, but I was too lazy to try that this week. Still, I did not feel like I missed animal protein in my pasta. On days when I felt a particular craving for the “weight” that animal protein provides, I worked harder on my meals. I especially enjoyed this “burrito bowl” with rice, beans, lettuce, carrots, green beans, onions, cucumbers, and tomatoes. It was so good, I ate the leftovers for dinner. Another hit was this chickpea curry I made. I’ve fallen in love with curries since moving to the Caribbean, and while I could never claim to make “authentic Caribbean curry anything,” I make a mean curry, Afoma-style. I threw in some jalapenos for the extra heat and the chickpeas were so soft and flavorful. Veganuary was going great, until it wasn’t. On the Thursday of my vegan week, let’s just say I took the day off. I had swim class in the morning and stopped for breakfast at a friend’s after. They offered me the best eggs ever, and I ate. Then, my landlady invited me and a few friends to lunch. There was pasta and chicken — which I ate. Otherwise, on my own, I was great at Veganuary, except maybe a piece of chocolate cake I had while working. It’s also stressful how many things contain animal products in one subtle way or another. While margarine should be vegan, some brands add animal products. Same for peanut butter. At first, I certainly experienced feelings of deprivation and felt the need to “eat more” to make up for the lack of animal protein — especially at breakfast. But after a few days, I adjusted to the fact that there would be no eggs. I even upped my breakfast game within limits and did not feel more hunger than I usually would. Vegans have my admiration for their food creativity and I enjoyed playing with meals I probably wouldn’t have created without the push of Veganuary. My only gripe with going vegan is the restrictive nature. While I made the effort to be chill about Veganuary, I can easily see how food guilt could enter the picture for new adoptees of the diet. As a foodie, I also disliked having to reject food because it was animal-based. Still, you could argue that other people should be more inclusive in their food choices. But is it worth the hassle? No, probably never, unless necessitated by health reasons. I like the freedom to eat what I want, while being mindful of the environment. I don’t eat animal protein daily — perhaps three times a week — and I think everyone could do with less red meat. People praise plant-based milk, but more studies are showing that without fortification, they may not contain the required calcium and vitamin D.
Veganism is a selfless, admirable choice, if it’s your choice, not out of guilt or peer pressure — for YOU. It’s also worth noting that vegans who do not force their choice on others rank higher on the “admirable” meter. For me, though, moderation is still the rule. What about you? Could you go vegan? Would you try it for a week or a month? How do you feel about veganism and diets in general? P.S: For more thoughts on veganism, read this interview with nine people who chose to go vegan - fully!